What are you even thinking, Lincoln? I'm not some agrarian backwater which you might hope to quickly subjugate with your superior population and production capabilities. I've got twice your cities, better upgraded. I'm the top empire in the world and you're the last. What could this Lincoln AI possibly hope to accomplish by attacking me? He'll take that one city, sure. Then before he can even reach the next one I'll have assembled a dozen troops and beat him back. Then I'll march right over and bash his cheating skull in! Of course, I won't do that because I gave up, because his utterly suicidal attack achieved the real goal of breaking my stride. Taking the time to build up a real army would drop my development below that of Suryavarman and Boadicea... so it would make sense if one of them had attacked me as a consequential rival. Instead, some penniless stooge from across the continent launches a kamikaze attack motivated by no in-game animosity (note we're the same religion and we've been trading and at pace and everything else which the game tells you makes other factions like you) which makes no sense, either pragmatically or immersively. It makes no sense, at least, if the AIs are meant to mimic other independent agents within the game world. It makes perfect sense if you assume the game as a whole is playing against you and is sacrificing one tiny portion of itself to screw you over. The richer civs continue to compete against you economically while a poorer one takes the bullet for them to weaken you. Except that's by no means how Civ 4 presented things. It's generally accepted (and resented) that the AI in strategy games always cheats. Shenanigans such as above are less off-putting than the usual route of outright giving computer opponents massive hidden economic bonuses but they nonetheless stand out as cheap, non-sequitur anvil drops. 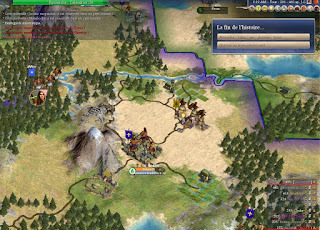 Civ 4's diplomatic system was meant as a means of avoiding conflict, but it quickly became apparent the AI was programmed to either ignore it when convenient or fake its way out of it, especially if the player starts getting ahead in the world. Competence must be punished. You'd often see two factions declare war on each other, fight little or not at all and spam you with constant demands to turn against one or the other, deliberately lowering their diplomatic standing toward you so they can turn against you. While any and all of this can come across as interesting mimicry of real-world events, games have rules, for the player to evaluate and use to whatever end. AI opponents should stick by the official rules. Being less abstracted than chess means maintaining in-universe motivations. A dark age civ should not be playing as though it knows about oil-driven economies or the end-game spaceship construction. They're not supposed to act as though they're in a game. The game itself should not be meta-gaming!